The OleumTech® IO MAX® Transmitter provides four analog inputs for supporting 4-20 mA or 0-10 Vdc signals. The IO MAX also provides two discrete inputs and two discrete outputs. The MX1 can be configured to operate as a master device interfacing Modbus, LevelMaster ASCII, or HART devices. Multi-drop up to 16 instruments. The IOMAX is powered using an external 9-24 Vdc source. This not only enables its users to customize their power solution, but also allows for the iomax to supply continuous power to connected sensors or slave devices if required. The field-proven wireless sensor node communicates with an assigned Wireless Gateway within the OTC Wireless Sensor and I/O Network, creating a highly scalable network, accommodating virtually any I/O requirement. 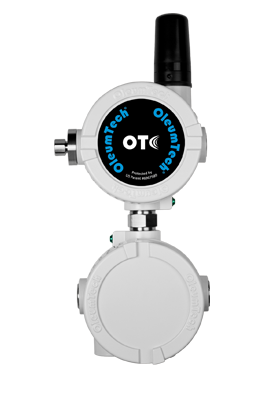 The OleumTech Wireless Transmitter is certified for use in Class I, Division 2 (Zone 2) hazardous locations and provides a robust RF range.